Crushed black slate mixed with dark grey quartzite. Screened mesh sizes: 20mm, 40mm. Crushed biscuit yellow to orange brown coloured sandstone. Screened sizes, 10mm minus, 20mm, 40mm. Crushed Harcourt Granite and crushed pure white Quartz – Memorial quality (20kg bags only). Screened sizes: 10mm minus, 10mm, 20mm. A selection of natural form stones are normally available for you to make your selection from – plaques may be inserted if so required. 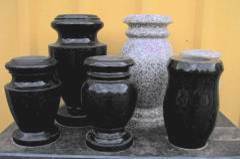 Headstone available in Shanxi Black Granite and Harcourt Granite. Other granite types may be ordered. Full memorial sets including ledgers and slabs. Shanxi Black Granite, some from G603 granite. Headstone side mounted half vases also available. 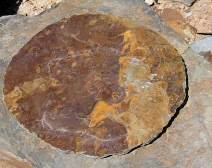 To order from various yellow orange brown sandstones. 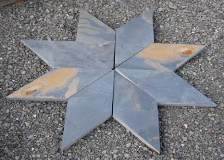 Standard stock items include flat topped 600x600x75 and 750x750x75mm rock face edged yellow/orange sandstone, and 600x600 pyramid shaped grey granite. Other shapes and stone types to order. 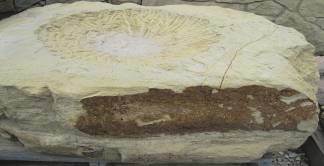 To order from Pyrenees Quartzite. Round, square, rectangular or irregular shapes. Natural break, hand chipped or sawn edges. Slate, sandstone and quartzite stone types. Sizes from 400 to 900mm diameter. Produced from slate and quartzite, normal size 150mm across flats, 20-30mm thick, ideal for circular paved areas and features. 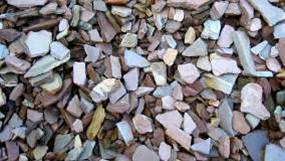 Mixed stone types including banded yellow and purple/orange sandstones, red brown black granites, marbles etc, sizes 200mm-9kg, 300mm-29kg, 400mm-68kg, 500mm-134kg. These can be fashioned to your requirements, either from a natural stone of your own choosing or expertly crafted from any suitable stone type to exacting dimensions and design. 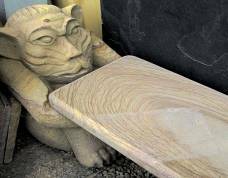 Garden seats, carved stone animals, from sandstone (above) or from more exotic materials, such as Green Marble (as below). 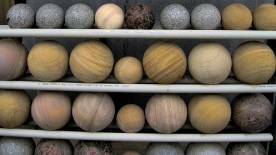 These may be made to order from whatever stone type and to whatever size is required. 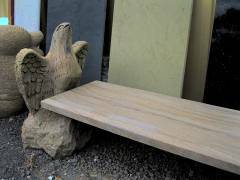 We can normally fabricate ourselves or source specialized stone items (eg. 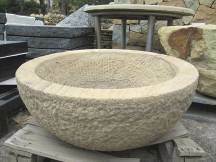 Fire surrounds, water fountains, garden furniture, artifacts etc) from most stone types. 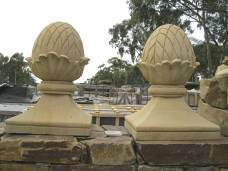 **Made from hand chipped sandstone with honed sandstone columns. Large scale specialized projects can be catered for at very competitive prices, with materials, finish and designs crafted to suit your needs. Stone gate posts, lychgates, pedestal and statue display bases, stone columns, water troughs, stone BBQ’s, arch stones, tree circles, over mantles, kitchen and cellar stone shelving, stone balls and gate finials, lawn edging – sawn or random, stepping stones, marble cutting boards, other stone products to order – your design or ours. Stone restoration and modification service - polishing, cutting, drilling and gluing. Stone sealing and maintenance products. 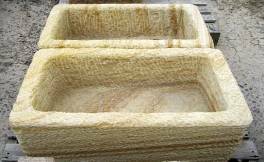 Stone working tools – professional quality only. Free information service - Click [here] to contact us.